Our program is unique amongst the Team Build genre. You receive the opportunity to not only make a very good income from the programs we are building teams in, but you can also make a very tidy income from the commission structure built into the Global Team Build site. You will also receive some excellent advertising for your current other programs. By way of illustration, assuming you have joined at the Silver Level, you are entitled to receive 50% commission on any upgraded member that you refer. So when a Silver member is placed under you, you would receive 50% of their $20 joining fee which equals $10. If a Gold Member joins under you, you will receive 50% of $40 which is $20. You can upgrade to a higher level at anytime and increase the amount of commission you will receive from future members joining under you. Remember that these are annual fees, so it can really mount up over time. If you were at the Gold Level and have 10 Gold Members placed directly under you, then you would make $320 per annum. There is no limit on the amount of directly referred members that you can have. We use 3 different Rotators within the Global Team Build System, one for each of our Team Build Programs. Within each of these rotators we will build several positions designed to reduce the waiting time it takes for you to receive your downline members. Eg 4 Corners operates on a 4 wide matrix, so we will be building four simultaneous teams. A newer program to hit the Internet in a storm has been Decide Your Path. It is run by a long standing reputable admin, Mike Peever, and although quite new has amassed a membership base of over 2,000. If you are familiar with 4 Corners, then this program is very similar. The pay structure is a 4 x 6 level matrix which tops out at $1,912,544 in earnings. The product is Banner and Text advertising, so the smart member would include their Global Team Build Text and Banners to increase their commission from our program. There is an optional monthly subscription plan which pays up to $30,040 per month, turning Decide Your Path into a residual income program. You will receive 4 members to progress you through to Level 2. We then do the same for your members and then come back to you finding you another 12 members to progress you through Level 3. This process continues going back and forth indefinitely. 4 Corners is a relatively new program with a number of compensation plans centred around a 4 x 7 Matrix. The company sells financial literacy information. You pay a one time $18 - $8 for Admin fee and $10 for the first level product. Out of that $10, $4 is paid to the person above you and $4 is paid to the sponsor in matching bonus. The Company then takes $10 out of your $16 and pays for your 2nd level product. One you have 16 people on your 2nd level, when they purchase the 2nd level product you will get paid $4 x 16 = $64. When these people first join and pay their $18, YOU DO NOT GET PAID - you have to wait until they purchase their 2nd level product. Same goes for those people on your 3rd level. When they pay their $18, YOU DO NOT GET PAID - you get paid when they purchase their 3rd level product. Same goes for levels 4, 5 and 6. You only get paid when they purchase the level product that you are on. Once the 3rd level product is purchased the next product that is paid for, from commissions is the Monthly Newsletter, then the 4th level product, then the 5th level product and then the 6th level product after which only the monthly newsletter will come out of commissions. The company will pay matching bonuses on Instant Commissions. So in time you could make $559,824 x 4 = $2,239,296. This will not happen overnight and may take some years, but oh what a payoff. If your 4 personally sponsored members make $10,000 - you would make $40,000. If your 4 personally sponsored members make $1000 - you would make $4,000. All of these amounts are possible, it will just take time. Everyone that purchases the monthly newsletter is placed in the above matrix, and you will get paid regardless of who referred the sale. As the company takes out the newsletter subscription after the purchase of the third product, it is a given that you can and will, overtime reach the higher levels. This is monthly income for life!! You will get matching commissions from the above table from the 4 members that the Team Build places under you. 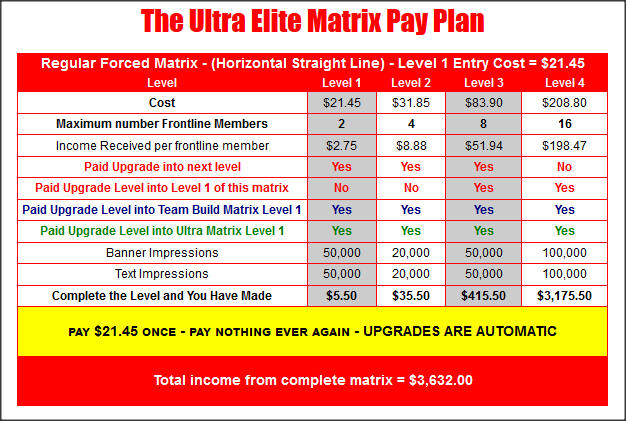 So when they complete their matrix as above, you would receive $76,026 per month x 4 = $ 304,104 per month. When they are at level 5 in the above table, you would make $2,304 x 4 = $ 9,216 per month plus whatever you are making from the table. Most probably $10,496 at that time, so you would be looking at a monthly income of $ 19,712 per month. This is our own program which we started in early February. Fast growth has been experienced with close to 4,000 members at time of writing (July 1st, 2015). The program consists of three different payment plans, however we here at Global Team Build are focusing only on the one, called Ultra Elite. Cost to get started: $21.45 one time, which includes Processor Fees. We build your team in a similar way to Decide Your Path in that we place two members under you, advancing you to Level 2. We then place two members under them, come back to you and place 2 more members under you, thus advancing you to Level 3 and so the cycle continues. Well there you have it - the complete money making system that is Global Team Build. You may have some other questions, so please check out the FAQ's and if your questions are not answered there, please drop me an email using the "Contact Us" link at the top of this page. As stated earlier, Global Team Build is a program for people who are serious about making a good solid income from the Internet. You will be required to do, although minimal, some work but the rewards will be well worth it. It will take some time to develop a largish income, but that is the nature of the Internet. Anyone who is telling you that you can make thousands of dollars in a matter of weeks or months is simply lying to you.